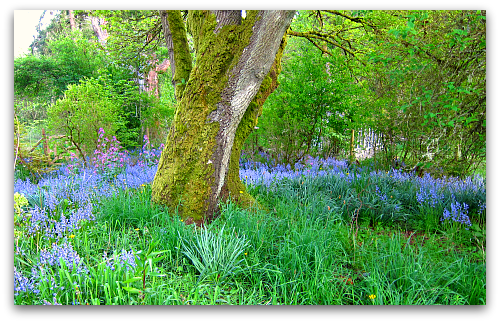 Outside my window, bluebells lap at the trunk of a bigleaf maple. A few warms days on the island, and Mother Nature takes notice. The orchard trees are set to bloom, the days get longer (just like my chore list) and the memories of a chilly wet winter fade with each flower’s bloom and every flop in the hammock. I have a few farm photos to share, as well as what’s been going on. I found the perfect finials for my work-in-progress kiwi trellis–such a noble and worthy breed to ward off pests and guard the fruit! 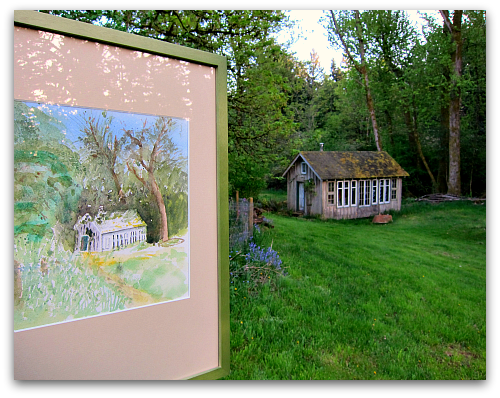 Art in and of the garden: My dear friend Phoebe came by to visit and share a gift from her hand and heart–a lovely watercolor of my cabin in the cottonwoods. After a year without bees, I enlisted the help of my friend David, the bee whisperer, to mentor me in the fine art of beekeeping. Here the queen is about to be released to the hive, while her attendants set up housekeeping. Garden gate: With age comes a fine patina and natural presence (which goes for people, too). 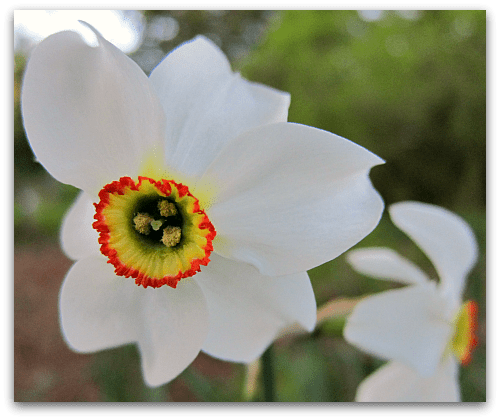 Narcissus Poeticus, aka the Poet’s Daffodil or Pheasant’s Eye, unfurls in a showstopping finale as one of spring’s most vibrant, fragrant and beautiful performers. Garnering sympathy: Here I am doing my best pouty face, thanks to a root canal that devolved into a pulled molar, and a myopic month of ill-fitting, broken glasses. Ibuprofen has been my friend. 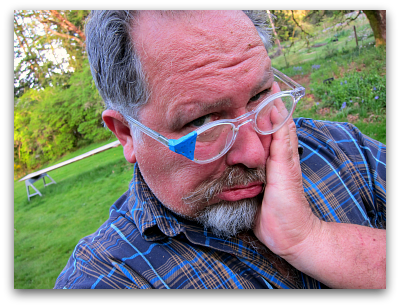 (More pouting: did I mention my replacement frames and lenses were lost in the mail.) 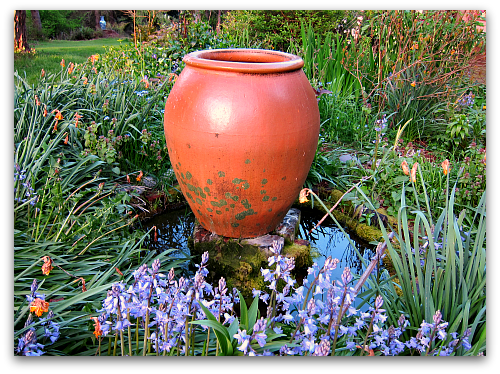 Not-so-golden silence: Algae got the best of my fountain pump, clogging it completely. I may have to replace the old pump with a larger one better suited to provide greater water circulation and aeration, and less perfect environment for green slime. What’s next? 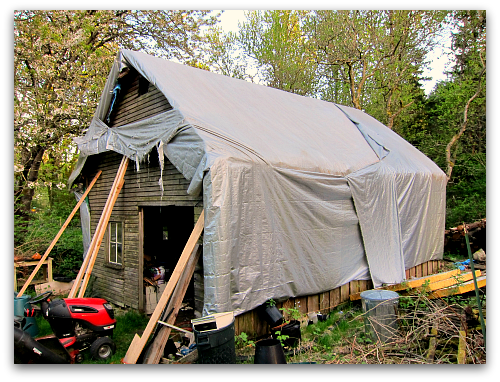 After nine years and six tarp layers, my 120-year-old barn needs a new roof (among other things). My goodness Tom, you are in speed drive. Have you retired? I don’t see how you can do all of that and still be working at a job. I’m glad you are finally having some warm weather. I thought spring would never come. I’m not sure it has; we seem to be having blackberry winter. We will probably go straight to summer after this. Don’t overdo; your hammock needs you too. Hi TG, not retired but trying to make a living loving what I do here at the farm, may have to branch out and teach some cooking/gardening classes, and rent out my cabin as a rustic experience. And don’t worry, the hammock has a gravitational pull all its own. You are a machine ! And you made cakes too??!! Thanks Kim, yep I made St. Clement’s cake. I’ll post the recipe; it’s orangey good. My boy Rambo says to tell you that’s mighty fine taste in “finials” you have there. Spring is very late here in NC. I’m sure by mid-May we’ll all be frying in the heat though… Sounds as though you may need to enlist some helpers for these multiple projects you have going! All are interesting for sure. That’s a lot of workload for one person there…. The poster above “Toadgirl” is right on “Don’t overdo; your hammock needs you too”! As do we!!! GDS is not the G-rated version of Getting Stuff Done, it’s the dyslexic version. And now for the oooohs and aaaaahs — you ‘n nature continue to conspire in creating little portraits of loveliness everywhere you point that lens, Tom. Thank you both. Deb I forgot all about that program-ruh-row! Well I started today and of course the roof is now off and the joists are in need of some work too, but not for me. I don’t do ladders and circular saws. Such beautiful photos. 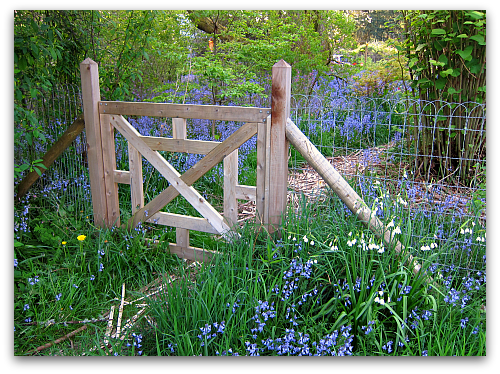 The bluebells and the garden gate are my favorites! I like your comparison of the days and the work load. It’s true—I guess I just never put it together! Thanks Sue — appreciate the visit and kind words. Tom, you are in overdrive! I’m just trying to stay ahead of the weeds! I love your finials. Have you seen any sheep versions? Anne I’ll keep my eyes open for some sheep statues, I did see some raven ones at our local nursery though. Tom, the finials are perfect. But, do you really need me to come to you and get this eyeglass situation fixed? Lost in the mail? That is a lame excuse. Truly, wish I could enjoy your spring at your house. It looks lovely, really! Thanks Susan, yep I got a call from the eyewear rep and she said my glasses were sent to Dallas. When I asked when I would get them back she said I had to re-order my glasses, but that the frame I wanted was no longer available. I fear I’ll be wearing tape for months to come–argh! Thanks Ina, yep I keep waiting for the soreness to go away. Tom, Every time you mention Phoebe, I become more intrigued. Is it wrong to covet someone’s neighbor??? Can you tell us a wee bit more about her without invading her privacy too much?! Pam she is indeed a special lady, and beloved friend. At 90, she’s quick witted, charming, cheeky and wonderful. I love her amazing stories of growing up England and the adventures of WWII and how she met her husband. Her family is just as lovely. This is a fantastic post, Tom! Your garden is looking so good – love the garden gate and the daffodils. My bluebells – none of which I planted – are great and are everywhere. How do they do that? A tiny patch grows into a humongeous patch so fast! My transplanted fig tree didn’t die, the dragonclaw willow needs pruning, and I whacked back the ivy growing up the wire fence. But, nothing can compare to the beauty of your place! And I’m so glad to learn that you have honey bees again! I had a lowly 20% survival rate over this past winter – my fault; I don’t know what I’m doing, really. The bees know way more than I ever will! David and I are going to try making our own foundation. Maybe your bee guy can comment? Picture heavy weight acid free paper coated with bees wax and made so stiff it will hold it’s shape. Place this into the frame, use fishing line to hold the foundation it – as per the “Fat Bee Guy” on youtube – put it in the hive and let the bees make the cell size they want to! Thanks for the post – stay safe and look out for electric power tools! It’s the “Fat Bee Man”! I’ve installed six frames of paper and wax foundation in the beehive Demeter. I’ll let you know how she does. Cheers, my friend! If I stood on my roof I could just about see you! Well, not really. Love the fence shot…and the cabin in the Cottonwoods. Just so charming. Not so much the news of your poor mouth, such terrible luck Tom. Thanks Jacqui, yep still sore, but perhaps in the next few days my mouth will get back to normal. It’s hard feeling sorry for you (o.k… I’ve had 2 root canals and they’re pretty awful, so you do have my sympathies). But to see what’s blooming and growing in your yard is more than I can bare!! I still have snow in my backyard! I may not get tomatoes planted until July 🙁 And let me know when you’ll be teaching cooking and gardening classes. That may be all I need to book a flight to the Pacific Northwest! I’ve had too many root canals !and they should not hurt! If it does hurt bite the endodontist on the finger and he/she should inject some pain killer directly into the poor old tooth. My endodontist is a great guy and if you ever need a root canal I’ll send you his address. Plus, while you are in the chair you will have a great view of the south end of Vashon Island, the ferry boat, and old town Tacoma! Hopefully this is my last for awhile, but if not, I’ll seek your referral for a pain-free endodonist. Thanks Margaret! Eileen, you could be the guest pastry chef instructor and I could stick to the lessons in the garden. And two root canals, argh, so sorry. Tom get well soon tooth ache is not fun! I hope a new pair of glasses will arrive soon. Your blue bells look fantastic. We are having a beekeeper placing hives in our community garden this year. The last couple of years the beehives were vandalized, hopefully they will be left alone this time. Good luck on the bees. How odd that someone would feel inclined to vandalize a beehive, as if it’s not hard enough to keep bees. Hopefully this time the vandals will find better use of their time and energy. 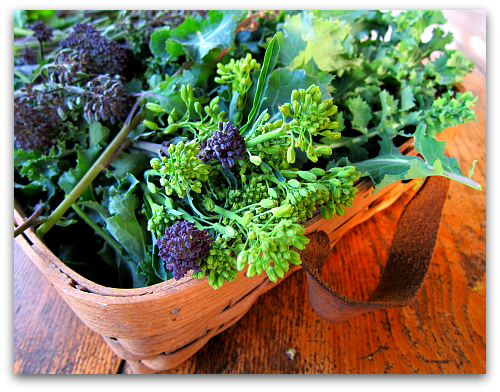 Keep those great veggie recipes coming! That picture of the maple with the bluebells is breathtaking! I think that bulldog must come from Easter Island. 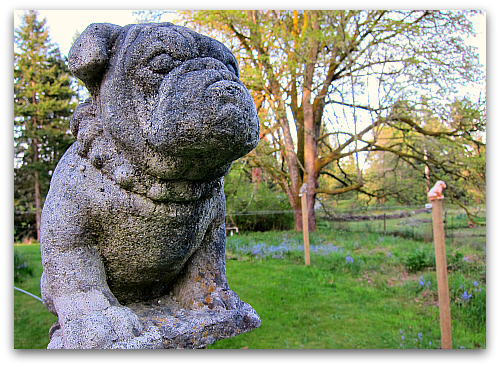 Thanks Jason, hey you’ve given me a great idea, giant-sized sculpted bulldogs lining my drive. Brilliant! Hi Nik, I used to live in Anchorage a bazillion years ago–the late 70s, then moved down to Juneau for several years. Congratulations on your first house. What a wonderful milestone, and don’t be too hard on yourself, just chip away at your projects bit by bit. That’s how I keep sane (or don I). 😉 As for the kiwi, it’s a vigorous vine in our climate of zone 8, too vigorous in a lot of cases. I’ll post more photos of the kiwi trellis project. Take care, here’s an early Alaska thaw and breakup. I fondly recall my many attempts at trying to win the Nenana Ice Classic. Otherwise known as The Amazingly productive farmer-man: our spring sounds much like yours–we’ve got a roof leak (this one on our house) that is bedeviling us to fix; we’re putting up a hoophouse; our rhubarb and asparagus and radishes and lettuce are producing faster than we can eat them; tomato cages need to be installed before the tomato plants are too big to fit in them, etc., etc. Isn’t it a grand life? Amy, I just read your hoophouse blog post and cracked up. I think we may need to start a support group for hoophouse wannabes–just to prepare them for what’s in store. What a great read and good laugh, so glad to make your acquaintance, and while I’m no Eliot Coleman, I’m so glad I can check in with his GFB from Nebraska for tips, tricks and gardening joy! Thre is a lot going on in your farm! Thankd for the lovely tour!